Who's going shopping this Bank Holiday? I am! I've decided to ignore the fact that spring is sucking so badly at the moment and focus instead on building a capsule wardrobe by adding a few summer staples as well as trendy pieces. Speaking of spring/summer trends, Part 1 of S/S 2016 Trends: The Hottest Shoes for This Season was so popular I've decided to come back and do Part 2 because I only covered a few of the many trends already marking presence this season and I really wanted to show you a few more! Plus, it's payday today (best day of the month ever, am I right?!) and I'm kinda wanting one of each- goodbye healthy bank balance, hello "poor for the rest of the month" status. Let's go! Meet the shoes that are classy, modern, comfy yet casual. 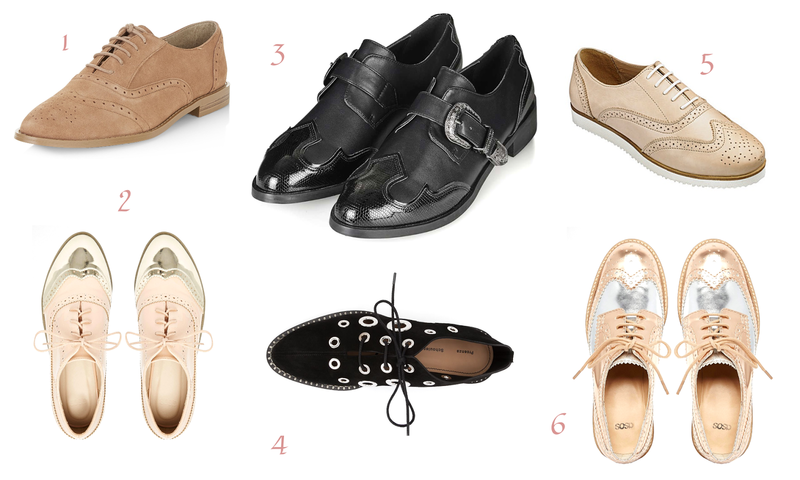 Long are the days when oxfords were seen as men shoes, not only are oxfords your best friends during the week when adding the finishing touches to your work outfit, take them into the weekend too and wear them out with dresses and even jeans for a more casual chic vibe; they are that simple to be styled! I have about 3 pairs and I love them. What's not to love? Yes, we all know about this one already but I thought I'd throw it in here because it is sooo hot at the minute, it'd be unfair to ignore it. 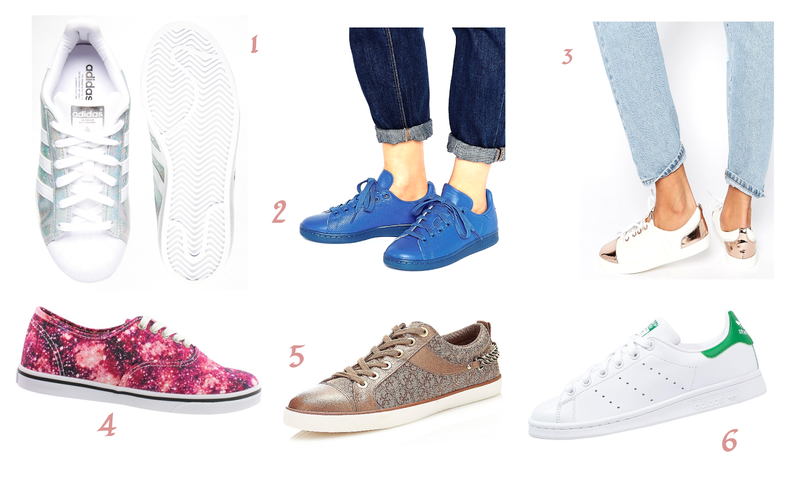 The sneaker/trainer/whatever-you-wanna-call-it has gone from a fitness shoe to a lifestyle one, it makes street chic super achievable and best of all, comfortable! As I stated here, a great outfit is all about mixing and contrasting, and the easiest way to achieve that is by swapping out your heels or sandals and going for a pair of cool sneakers instead. See how I styled a button-down skirt with classic Stan Smiths for some inspiration here. I made a vow to myself earlier this year that I would totally try wearing more colour, and I think I've been pretty good so far by wearing less black day by day. Now that spring/summer is around the corner, the rainbow shoe is one I definitely want to try. It's simple really, all you've gotta do is let your shoe do the talking, a bright pair of Summer sandals for instance will not go unnoticed! And, if you're afraid of it not going with your clothes think twice; the great thing about having every colour under the rainbow on your shoe is that it will seamlessly match anything and everything you decide to wear with it. No, these aren't only for weddings! This season, the white shoe is the freshest and trendiest colour to jump on. No matter which silhouette you choose, you cannot go wrong with a sleek and polished pair of white shoes. I recently styled a bright orange dress with two different pairs of white shoes and I loved it; see it for some inspiration here. Simply put: the sexiest shoes of all time! They were hot last year and this season they aren't going anywhere. After I bought my first pair, I realised it wasn't going to be enough and I wanted more. I now have two flats, one heel and have you seen lace up gladiators? I WANT! And best of all, they are perfect for transitioning your wardrobe into spring. And last but not least, the famous slipper. I hear you, a bit out there for some (me included), but you can't deny that this is quite possibly the easiest shoe style ever. If you are fashion-forward and up to trying things that are slightly outside the box, this is the one to try this spring. Mules, on the other hand, are definitely much more me because I love how simple they are to wear yet how cool they look on. Slip it on, get comfy and on trend. What's your favourite out of these? Seen my previous post? HERE. Thanks for reading lovelies and wishing us all a nice long weekend! *Sponsored post. All images are from respective websites and collages were created by me. All opinions are my own (disclaimer here). Que lindos sapatos amei arrasou, tenha um bom final de semana. I love all of the lace ups! I think they really make an outfit! I feel a shoe haul is needed now! I really want Oxfords; I'm happy to say that I have two pairs of lace up's; however, they are open toe sandals, and I need some closed toe ones, which would be good for the office, and I really want white sandals for the many weddings I have coming up to attend. The mules are definitely my favourite, I love the heeled mules especially. Não me importava que alguns desses modelos fossem meus. I needed this post! I'm going shoe shopping next week and there are so many styles that I want!! I like slipers, but for summer they are not always practical :-) Great selection my dear! Cute picks! Love the menswear vibe of these! Enjoy your weekend! Wow, what a collage gal!!! I bloody love those ASOS white sneakers with gold metal on top - they look so much more expensive than £26!! Love the lace ups and the rainbow selection. LOVE THEM ALL! Please check out my latest lookbook challenge. Been looking for a pair of lace ups for ages now, I love them! In love with the lace up trend this season! Such an easy way to make your outfit just a little more stylish. I so love the lace up shoes. The baby pink ones are so fab. Out of the 5 trends that are featured here, I know I could only pull off white and laced up, my husband would frown and think I lost my marbles if I ever attempt the other three. LOL! I'm trying to kill two birds with one stone and buy myself a pair of white oxfords! I love that they are in trend right now, they look amazing! I love the lace ups! I love oxfords! Such great picks - especially like No 2 and 6. Não me importava nada que alguns desse modelos viessem cá parar. All the lace are stunning and I've been wanting to have one. Thanks for your wonderful comment on Qing's Style Please always keep in touch, I would love to hear from you! I love the boots in the first photo and all of the sneakers, great picks! Wow! Very cool collection of shoes, my dear! I always love the lace up shoes. I'm a big fan of mules. I recently got a new pair from Clarks and they are so comfortable and go with everything. I love them. Oh wow, dear Pam, I loved the first 2 number 5, and then the white number 4 and the amazing laceup number 3! I want one of each!!! :) Gorgeous shoes!!! Hope you have a lovely week! There are so many beautiful shoes I need in my closet.......Happy May, Pam.